Once the initial shock of a death has passed, easing into the schematics of a funeral is the next step. Ideally, you will have already planned out the various components – from the coffin to the flowers to the caterer. Funeral programs are yet another component to consider – they may seem small, but they can have a tremendous impact on your guests. They not only serve as a beautiful way to honor the deceased and provide your guests with a one-of-a-kind glimpses into the life they’re remembering. Of course though, like all the other things that go into a funeral, there are numerous options to consider. Do you purchase a template for the program and print it yourself? Do you have someone else create the program and print it for you? Or do you go it alone with a completely custom approach, building everything from scratch? There are pros and cons to each option in terms of cost, time, and creativity. In this post, we will evaluate each one to help you ultimately make an informed decision. Shipping Cost $0 $0 $0 – ? If you want complete creative control of the look and feel of your programs, you probably are best off designing your funeral programs yourself. This may be the most financially sensible option, but it’s the most time-consuming, too. You will be able to dictate every aspect of the funeral program or prayer card – color, quotes, images. But if you have a dozen other balls in the air, do you really want to spend hours developing the perfect program in addition to printing possibly hundreds of them? Going this route means you also need access to some kind of design software like PhotoShop or InDesign. Plus, you can’t skimp on paper for the actual physical programs. Cost may be a benefit here, but you risk quality in the end product. And you risk some peace of mind, too, as this is the most stressful option on top of an already stressful situation. The real benefit of doing it yourself is you can customize a program as you see fit in the memory of the deceased. If you’re seeking a one-of-a-kind tribute, you might be willing to bear the time in favor of a funeral program that accurately captures your loved one’s spirit. There are plenty of templates you can use for a funeral program. This might be the most viable option if you’re crunched for time, but still want input and control of the final product. 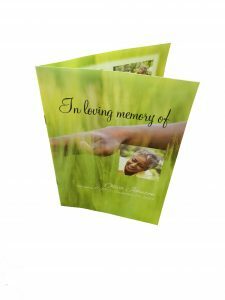 Cost of these funeral program templates range from free to about $75. 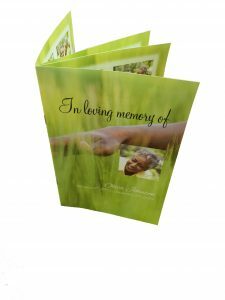 Some resources for funeral program templates include various pages on Etsy and Zazzle as well as template sites. Be warned about using templates, however – if aesthetics are important to you, you might find yourself doing a lot of digging to find templates that meet your needs. A lot of templates out there don’t exactly look contemporary in appearance. When you add in the cost of printing, you will be looking at a good amount of money if you are printing over 100 programs. You can go the way of a national options, FedEx Office or Kinkos-type business, or with local printing shops, but either way this is where the cost adds up. They charge for the basic black and white printing on standard paper, but if you want full color, higher quality paper and ink, folding service, and a quick turnaround, that will add up. Funerals are not cheap affairs, and this won’t help ease the financial burden, either. If you want minimal involvement and wish to offload your funeral programs to someone else, working with a vendor makes perfect sense. After all, funerals are emotional times, and a funeral program may be the last thing you want to worry about. You could choose a designer who works in a variety of facets, or you could partner with a full service printing company. Price here falls in the middle – it won’t be quite as low as doing it yourself but it won’t be as expensive as if you went with the template option. Expect prices to start near $345 for 100. But even if this price is more than what you want to spend, consider the peace of mind you will receive from minimal stress in addition to the high standard quality of letting an experienced professional handle the process. FuneralPrints.com is Here to Help! Our mission to make designing and printing funeral programs easier was inspired by the tragic loss of one of our own. From then on, we’ve strive to make this process the least stressful, the most affordable, and with the quickest possible turnaround. Please call our helpful phone staff at 1-800-774-4313 with any questions or concerns. We would love to help you pick and design a funeral program today!